How Does Your Resume Score? 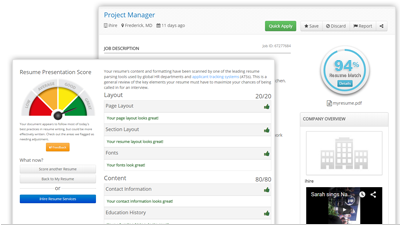 Use our Resume Tools to evaluate and improve your resume. Resume Review — Identify common resume mistakes. Does your resume utilize consistent margins that are larger than 0.5"? Extremely narrow margins can negatively affect how the document is printed and displayed online. How compatible is the font you used? Is it supported by all software? Did you overdo it with bold and/or italics? Too much emphasis can have the opposite effect. Does your resume include a summary section? Did you avoid including too much personal information or unnecessary details like hobbies or references? Have you properly displayed your education history? Did you remember to include the type of degree you attained as well as where you studied? Is your work history covered? Did you remember to include your position title, employer name and location, and the job's start/end dates? How many skills are included in your resume? Have you done enough to promote your unique qualifications and boost your resume's impact? iScore Resume Match — Score your resume against a job. Compare your resume directly to the requirements of a specific posting and receive valuable insight on whether or not the skills listed on your resume meet the employer's demands. By using iHireHR's exclusive resume tools you maximize your chances of making it past the applicant tracking systems most employers and recruiters are using nowadays. See how your resume stacks up against the skills and qualifications listed in a job posting before submitting your application. Unsure how to fix the problems identified in your resume? Let our team of Certified Advanced Resume Writers help! Our writers know what employers in the Human Resources industry are looking for and have been trained in the most effective formatting and keyword optimization strategies for modern resume writing.